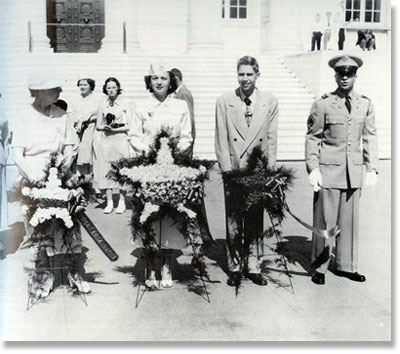 The early organizers and founding members (Including First Lady Eleanor Roosevelt) saw GSW as an organization for and by military surviving spouses to collectively work to improve benefits for the Military Surviving Spouse. They supported each other and reached out to new widows. Each successive generation has endeavored to do the same. During periods of war, our organization is extremely busy as we take on new members. However death comes to the military in peacetime, training, and disease as well. One story told by one of the early members, Myrtle Tedesco who unfortunately passed away aptly on Memorial Day 2013, is of military surviving spouses moving in with each other to help care for the children and collectively pool resources. As it was told, "I watched her kids at night so she could work, and she watched my kids during the day so I could work." She added, "You know we didn't get much money back then, and I had to go to his parents for it and they distributed it to me." Myrtle once recounted how she was notified of her husband's incident. "A boy rode up on a bicycle and handed me a telegram- It said my husband was Missing in Action. He was piloting a plane over the Pacific. I never heard another word. A year later I received another telegram by the same boy on the bicycle. It said the Department of War regrets to inform you that your husbands status has been updated from Missing in Action (MIA) to MIA- Presumed dead". Unfortunately they never found Myrtles husband, and she received no more updates on his status. 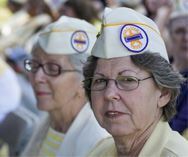 She never received a folded flag and received minimal widows benefits. Banding together these pioneering women (yes back then they were all women and now we have members who are men), made a conscious decision to change these and other scenarios, by initiating change through Congressional Advocacy and Community Awareness. 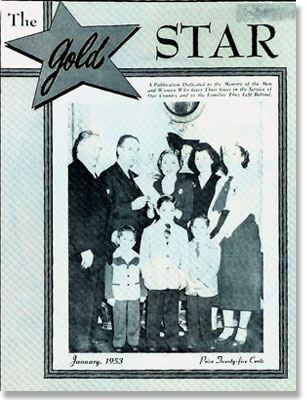 A complete history of Gold Star Wives of America may be purchased at our online store.